“You’ve done it on an Indian Chieftain and on a Street Glide .. do it on something different, how about a Road Glide?” – “I’ve ridden one .. I don’t like them …” was how my discussion with Tim Orr, Eagle Rider UK, started when selecting a bike to ride coast to coast (Orlando to LA) in March 2018. 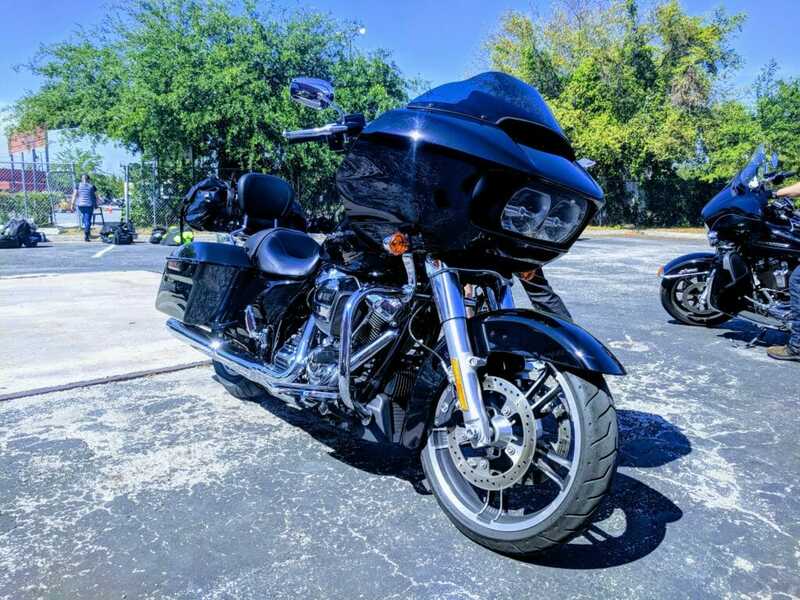 Six months later I found myself looking at a very shiny, almost new, black Road Glide in the car park of Eagle Riders Orlando branch. “Hmm, not a looker I thought to myself”. 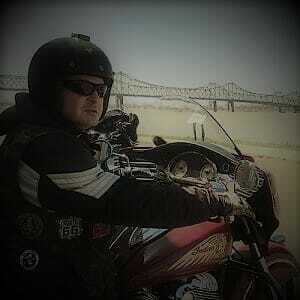 So what did I think after 4287 miles across 8 States of America on her? I’ve made similar trips 4 times previously, twice on Indian Chieftains and twice on Street Glides, and found both bikes to be excellent solo tourers more than up to the task with probably the Street Glide being my preferred tool for the trip. The Road Glide would struggle to impress I thought. First impressions? As I said I don’t think it’s a looker but others do. Sitting on the bike undoubtedly comfortable with the handlebars being slightly higher than the Street Glides. All other controls the same and the easily (more so than Street Glide) accessible pods for charging phone, stashing stuff a nice touch. Quick ride around the block before the trip in earnest. The key difference between this and the Street Glide is the fairing. The bat wing of the Street being handlebar mounted while the Roads is frame mounted. I’ve never owned a frame mounted faired bike, well I have but I took it off, and I found when riding a previous Road Glide the fairing not moving “odd” and a little disconcerting – and I did again. 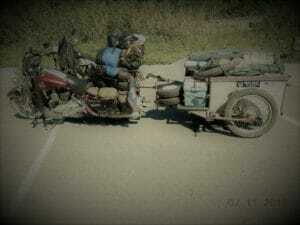 Once out on the highway the fairing seemed to offer good wind deflection even with the short screen fitted. I saw other Roads with a higher screen and presume this is a HD option. I’ve always been lucky in that I seem to be the right height for HD’s short screens and rarely suffer any buffeting. The 107 cui Milwaukee 8 motor in the bike is a peach. The last Street Glide I toured on had the same and it’s low down grunt makes riding effortless and at a standstill is much less vibey than the HD’s of old. The transmission is still clunky but I found myself dropping back into heel change mode without thinking. All displays and controls are clear and easily selectable and I have to say over the course of the trip the sound system was excellent for helping to pass the unavoidable less interesting stretches of road you come across. Part of my trip I revisited two of America’s greatest biking roads, the Twisted Sisters in Texas, and the Devils Highway (191) in Arizona and formerly designated US666! So how did the bike cope with these? Simple – flawlessly! I think HD have done a great job with their new soft tail chassis with improved ground clearance and feeling much more stable in the bends, especially tight ones. While still no sports bike the Road Glide will carve through the bends far better than most would expect. Both roads left me smiling and at no point did I feel the bike was out of shape. 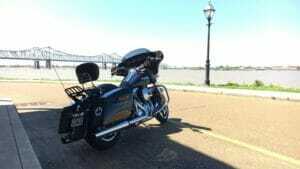 Where I really noticed the difference to the Street Glide was on open roads with cross winds and crossing the many bridges you find in the Southern States particularly. The Streets bat wing tends to be a bit of a sail in these conditions causing a little handlebar wobble, the Road had none. The bike has two hard panniers fitted as standard, which I used to store waterproofs and other sundries I need quick access to while my main luggage, a waterproof roll bag, fits on the luggage rack. More than adequate for two weeks solo touring I find. So at the end of journey had the Road Glide won my heart over? Yes – never thought I’d say it but the Street Glide has been supplanted (although that’s not to say I won’t have an affair with another one ) and I think Road Glide is my new tourer of choice. Having done several 400+ mile days and one 500+, It is genuinely all day comfortable. The tank will easily give you 300 miles range and the motor, chassis etc. all add up to really great package for a trip such as this. I’m a convert! ← How many shirts do I need?